The Chicago Cubs will face the Chicago White Sox in the 2009 Cross-Town Classic! When this interleague-cross-town matchup gets underway, you definitely do not want to be the only person left out of the fun. See the White Sox and the Cubs play one another, and no matter if it’s at Wrigley Field or U.S. Cellular Field, the action should be intense. This one is for bragging rights, people! 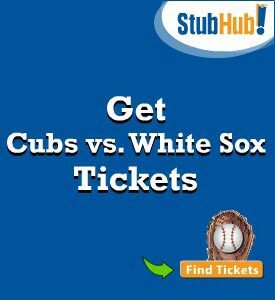 Windy City baseball fans, get some Chicago Cubs vs. Chicago White Sox tickets today, before the rest of the Chi-town sports fans snag them all up! Get your Cubs gear ready to go and root, root, root for the CUBBIES!!! Sing Go Cubs Go after each Cubs win – on the Northside or Southside! I hope someone will bring a bat or two.